With the new furniture finally delivered to your home you are probably looking forward to have it assembled and set up, ready to use. Call the experienced technicians and watch the flat-pack transform into a wardrobe, bed, table, looking as good as it did in the shop. Our professionalism in combination with the years of experience in putting together furniture made by most big retailers, guarantee you will receive quality services. 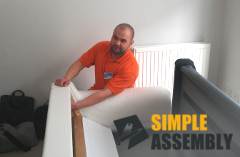 And on top of it all, our flat pack assembly Hendon NW4 come at prices that are hard to beat. The professionals have the skills and tools to deliver the right assembly service for your property. And to make sure we will continue to deliver the first class services we always have, the team members undergo regular training in safely and quickly putting together different flat pack furniture. Along with great looking bed or table, ready to use, you will enjoy some of the lowest prices around. Pick up the phone and dial 020 3404 5905 now! Talk to our customer care representatives about great services we offer, and receive free, no-obligation quotes. Alternatively, use our live chat to get more information on our service while online, and if ready to order Hendon NW4 furniture assembly, fill in our online booking form. The nearest tube station serving NW4 Hendon is Mill Hill East.